In the last week of July 2014, IAS aspirants in North India went on a mass protest against the CSAT (Civil Service Aptitude Test), introduced as the second paper in the preliminary examinations for the Civil Services. This protest echoed in the Parliament, leading to adjournments. The Union Public Service Commission (UPSC) is an independent body that selects candidates to various positions in the Central Government. Earlier, the selection of suitable candidates to the Indian Foreign Service (IFS), the Indian Administrative Service (IAS), the Indian Police Service (IPS) and other allied services, were done at two levels, viz. the main examination and the interview. Since several hundred thousand candidates applied for hundreds of posts, in 1979, UPSC introduced a three-level system to select the candidates. A preliminary examination was conducted to select the candidates to the next level of screening, the main examinations. Out of the number of candidates writing the preliminary examination, about twelve times the number of vacancies were selected for the main examination. In 2014, about 8 hundred thousand candidates applied for the Civil Service examination. Usually, four to five hundred thousand candidates write the preliminary examination. Though not declared officially, there is an estimated 1200 vacancies. Nearly twelve times the vacancies, i.e. 15,000 candidates might be selected from the preliminary exam, to appear for the main examination. In view of the growing number of IAS aspirants, and the challenges faced in the administration, UPSC altered the format of the preliminary examination by including a paper labelled ‘CSAT’ (Civil Service Aptitude Test) to test the seven critical skills as comprehension, interpersonal skills, logical reasoning/analytical ability, problem solving/decision making, mental ability, basic numeracy and data interpretation. This paper is set in the English language level of Standard Ten. There would be 80 objective-type questions for 200 marks. The candidates need to tick the correct answer from the options. The Hindi translation is also provided under each question, so that the candidates can answer either in English or in Hindi. Just 8 questions (out of 80) test the simple comprehension skill of the candidate in English. For these 8 questions, no Hindi translation is provided. Incidentally, only graduates are eligible to appear for the Civil Service Examination. 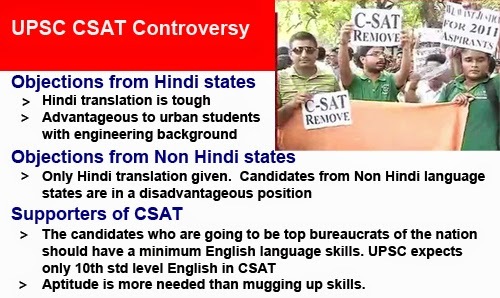 The CSAT paper was introduced in 2011 and UPSC has already run this examination thrice under this new system. v The Hindi belt students argue that the translation into Hindi is of a higher standard. According to them, people with the knowledge of the English language have an advantage. They allege an unfair level-playing field between the rural and the urban students. v The non-Hindi speaking students argue that the paper provides only the Hindi translation. Non-Hindi speaking students, who are not comfortable with English, are unable to depend on Hindi as their Hindi-speaking counterparts could. They complain that the Hindi-speaking candidates have undue advantage of the Hindi translation. They in turn, allege that there is no level-playing field between the Hindi-speaking and non Hindi-speaking candidates and that this is discrimination. They demand translation in all the 22 approved Regional Languages. This problem had cropped up on an earlier occasion. The previous Government (UPA) had then set up a 3-member committee to examine the issue. It may be noted that UPSC is an independent body and is not under the control or aegis of the Central Government. The Union Minister has announced that he would request UPSC to postpone the exam. Technically, this appears improbable to happen. Priya, an IAS aspirant, says that the new system does test the aptitude of the candidates, instead of the ‘mugging up’ (learning by rote) practice. As a South Indian candidate, she feels it is biased towards the Hindi-speaking candidates and she questions why Hindi translation should be given for an English paper. She questions why an IAS-aspirant, who cannot understand even a Tenth Standard level of English, should aspire to join the Civil Service. Shankar, who runs a well-known academy of coaching for IAS, says the urban candidates and IIT/IIM graduates find the CSAT examination paper far easier than the others. He also feels that the current format of the question paper is advantageous for the Hindi-speaking students besides the science and engineering graduates. R. Nataraj, former Director General of Police and former Chairman of the Tamil Nadu Public Service Commission, says the IAS aspirants need to have an aptitude for problem-solving and decision-making, and a basic knowledge of the English language. He says the selection process cannot be conducted according to the candidates’ terms, but has to be designed to suit the changing requirements of the employment sector. He makes a clear distinction between election and selection. While the politicians who are elected can be removed after their term, the selected officials cannot be removed during their service. Hence, he feels the selection has to be carried out carefully, so that most suitable and meritorious candidates get selected through a selection process which offers a level playing field to the aspirants. With the impending elections in the Hindi belt and other states, there would be more political pressure on UPSC to dilute the quality of the selection process for the top civil service posts. Few will have the courage to stand by the demand for upholding high standards of the candidates, to equip them to meet the global standard. They fear being accused of being ‘anti poor’ and ‘anti rural’. The Only Solution – Let the Candidate Prepare His Own Question Paper and Write the Examination! (With tongue in cheek) The only solution to the problem is to permit the candidates to set their own question papers on subjects they are comfortable with, in their preferred language, and write the answers to those self-selected questions in the examination hall. This way, UPSC would not have to worry about setting the question paper and can save on printing costs. Depending on the other parameters, additional marks also can be given to satisfy all the stakeholders.